You’ve seen them. Perhaps you are “them”. Those women that post their pics on Facebook after they just delivered their baby and they look INCREDIBLE! I almost never look at their new baby because I am in shock with how un-sweaty, un-blotchy and un-swollen they look. Their hair looks perfectly quaffed and their eyeliner and mascara are in place and not all smudgey looking. How does this happen? If it is you, how do you do it? I’m really speaking out of jealousy here. My “post-labor” pic is not flattering at all!!! I took one because it is expected and I thought no one would see it. Well Husband REALLY wanted to show his co-workers the pic and I reluctantly said okay. Three weeks later I went to his work picnic and everyone told me how great I looked. I looked just okay, but their only reference of me was that post-labor pic, so I probably looked like a super model in comparison. This time around I am going to try to look like one of “those” women. “Why?” you may ask. “That seems pretty vain.” And you are right it is TOTALLY vain, but guess what, I don’t care! There is so much out of your control when you go into labor and deliver your baby. You can have a Birth Plan but that is just your ideal of how you would like things to go. You can go early, late, in public, or home alone. It can go quickly or take forever, you may need drugs, the drugs may not work, you may need surgery…SO MUCH CAN HAPPEN! So let me at least try to have control of ONE thing and that is my “post labor” pic. My Birth Plan is go natural again. My Post Labor Pic Plan is to go all faux. I plan to have my hair in a tight bun or braid of some sort. I will have eyeliner, mascara and any other cosmetic I can manage to get onto my face while having contractions. I also want to take a note from Christina Applegate and search for that perfect headband. 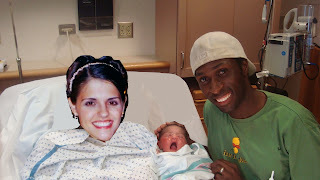 And if I still look like a hot mess in that post-labor pic, I will use Photoshop. YOWZAH!!! 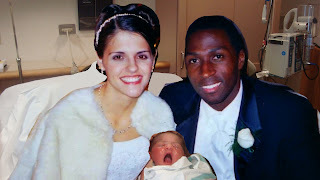 After Em was born, this was the pic Husbands co-workers saw…OF COURSE I looked good after that. Anything would! Ill just use this pic from our wedding, I look nice and young, I think people will buy it. Well I still have some time. Vain or not, just give me this. Do you like what you see around here? Help my little blog out and vote for my blog simply by clicking the link below. Thanks folks! You can also Subscribe to VeryLegendAryee. Haha, Tiffany, you crack me up! This is hysterical! Seriously, I looked like Shrek after having my daughter. NOT CUTE! LOL! I was swollen and in so much pain from the c-section. If I do it again, I’m bringing a hair and makeup team in for good measure!!! Right!!! A team is good idea, less work for you! Lol, love this post! Unfortunately (fortunately? ), I haven’t experienced birth…one of the pros to adoption!? I found you through the Mommy Brain Mixer and I’m your newest follower! I’m looking forward to your future posts!